Will India get freedom from open defecation? The maiden Independence Day speech of Prime Minister Narendra Modi, from the premises of the Red Fort last year, was full of how to make India clean by 2019. Soon after, the PM launched the Swachh Bharat Mission (SBM) in October, with construction of toilets as its main component. Unlike the Nirmal Bharat Abhiyan, a similar scheme launched by the UPA government, SBM delinked itself from the Mahatma Gandhi National Rural Employment Guarantee Scheme (MGNREGS). This was done because the government found that the construction of the number of toilets had slowed down in 2012-13 and 2013-14, after the convergence of two programmes in 2012. With this, the Modi government also set some targets of construction of toilets in both households and schools. 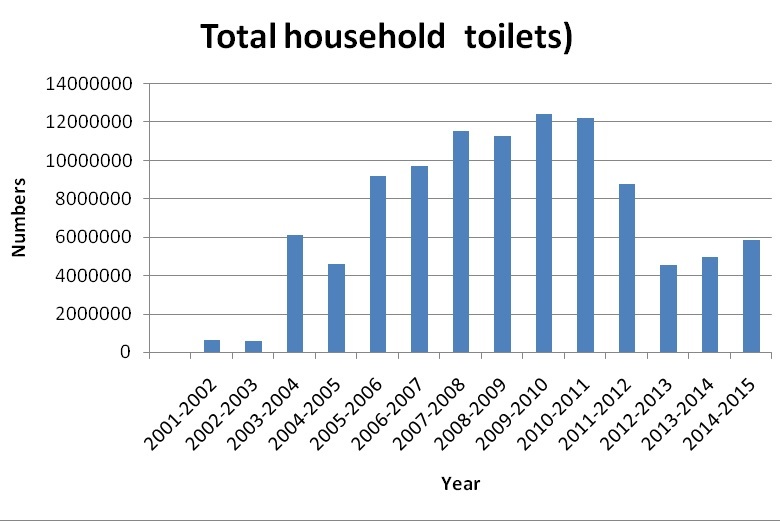 According to the Ministry of Drinking Water and Sanitation, the target for households was set at 98 million more toilets by 2019. This means 67,000 toilets in a day or 46 toilets in a minute. The number, however, does not go well with the past performance of the government which says that under the Swachh Bharat Abhiyan, in the financial year 2014-15, 11 toilets were constructed in a minute. This means that construction has to speed up by four times the present rate. At the pace of 2014-15, the target would be achieved by 2032, and not 2019. 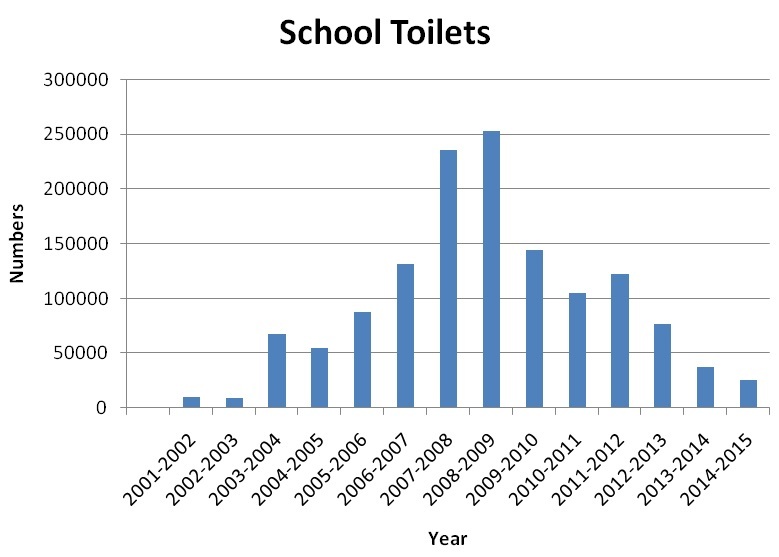 For school toilets, the ambition set last year was to get one toilet in every school by 2015. School toilets were introduced under the Total Sanitation Campaign (TSC) in 1999. The target at that time was to get toilets in all types of government schools (primary, secondary and higher secondary) under the Sarva Shiksha Abhiyan (SSA) scheme, by 2013. The target was, however, not achieved. TSC was replaced by Nirmal Bharat Abhiyan (NBA) where schools that were not under SSA were also included. No deadline was given. Constructing toilets in schools is an easier task as there is no need to spread awareness among the users. Even the location of the toilets on the school premises is more or less fixed. What is needed is proper design, water connection and operation and maintenance schedule. SBM was launched in October 2014, whereby the target was to construct toilets in every school by August 15, 2015. Below are a few numbers from the Swachh Vidyalaya handbook that reveal the huge gap between what already exists and what is to be achieved. Did Modi government manipulate data to achieve targets? Narendra Modi had set a timeline for construction of toilets in schools in August 2014. This is why he personally inspected the progress of school toilets in June 2014. Based on the data provided by the Ministry of Human Resource Development (MHRD), the prime minister was reportedly satisfied as most of the states are close to achieving the 100 per cent target. To be doubly sure, he asked the cabinet secretariat to keep an eye on implementation of the programme. A series of meetings were held as a follow up. At the end of June 2015, MHRD also noted that public sector undertakings (PSUs) were working at a very slow pace and might not be able to reach the target. The states were then asked to take charge of constructions that had not been done by PSUs at national level. The Centre even planned to use the fund from Sarva Shiksha Abhiyan (SSA) and Rashtriya Madhyamik Shiksha Abhiyan (RMSA) for these constructions. The PSUs were then requested to organise the flow of funds to district authorities by July. Determined to chase numbers, the Centre did not even mind temporary toilets for schools, constructed on rented and private premises and sometimes in an adjacent government-owned land. For flood-affected areas, there were plans to build toilets on sites of relocation. In a nutshell, the PMO and the cabinet secretariat were desperate to achieve the 100 per cent target of school toilets. Toilets in schools are being built under Swachh Vidyalaya campaign that was launched by Smriti Irani, Union Minister of Human Resource Development, in September last year. A circular was issued by the MHRD ministry in November last year about the action plan for 2014-15. According to the plan, a target of 30,000 toilets was set to be achieved between October 2014 and December 2014. Another 150,000 toilets had to be completed by the corporate or the private sector units (PSU). Up to 80 per cent of this had to be completed by the end of the financial year 2014-15. About 125,000 toilets had to be completed under SSA and RMSA. This meant that by the end of March 2014-15, target was to construct about 275,000 toilets. Following the meetings in June and July on school toilets, the HRD ministry also came out with a press release to clarify how many toilets had been built till then. 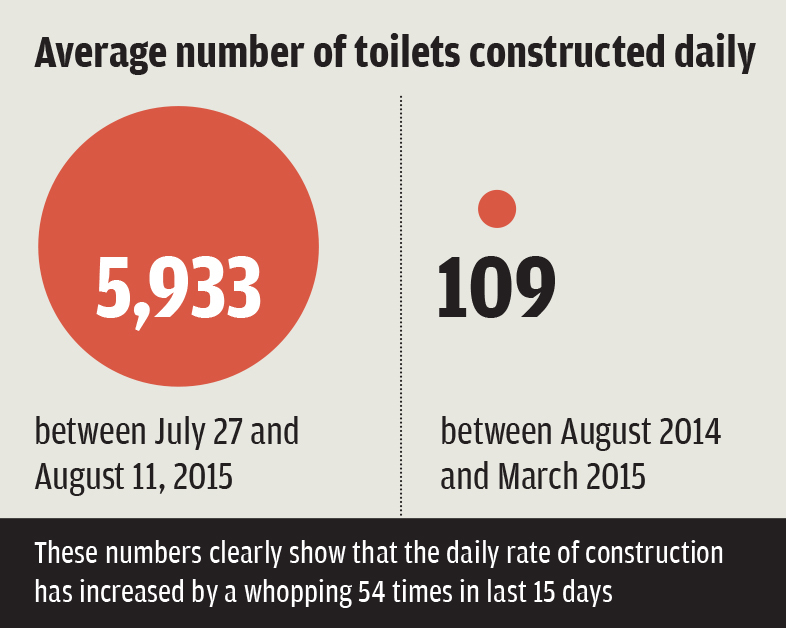 The data says that about 317,000 toilets had already been constructed till July 27, 2015. The Unified District Information System for Education (UDISE) data of 2013-14, that gives a complete database of schools in the country, says that there is a need for 419,000 toilets in the school. Hence, there is still a short fall of over 100,000 toilets. The website for Swachh Vidyalaya, on August 11, said that 97.16 per cent of the target has been achieved and remaining 11,882 toilets will be constructed in four days. Meanwhile, according to the data projected on Swachh Vidyalaya website, the numbers of completed toilets being built daily seems to be skyrocketing unrealistically. While on August 11, twelve states were listed in list of pending projects, the number went down to four the next day. Also, there is no clarity on what is happenning in Union Territories (UTs) like Delhi, Chandigarh and Lakshwadeep, though the website says that all these UTs have achieved the target. Mission accomplished at an astonishing rate? According to latest data avaialble from government sources, while 22,838 toilets were constructed in seven months between August 2014 and March 2015. This is in contrast with the numbers revealed by Swachh Vidyalalya website that says the government could construct 89,000 in 15 days between July 27 and August 11, 2015. The Modi government seems to be ignoring the fact that statistical interpretation of some data are making their desperation to achieve the target very clear. The rates at which the government has worked for this mission are more than 50 times of any initial drive. The data sheet for few UTs are totally absent from the website. Moreover, if we see the performance of schemes since 1986, when the first national sanitation programme was launched, it is seen that numbers never actually matter. It is poor maintenance, improper designs without water connection and lack of awareness that made the existing toilets also dysfunctional. When Prime Minister Narendra Modi launched the Swachh Bharat Mission (SBM) on October 2, 2014, he said the ambitious aim of achieving a clean India by 2019 would only be possible through joint efforts. With this, he hoped to enlist the help of corporates. Following the announcement, the government set up the Swachh Bharat Kosh (SBK) so that big and small corporations could provide help to the mission by donating funds under their Corporate Social Responsibility (CSR) programmes. SBK was also established to attract funds from individual volunteers. However, only a few PSUs (Public Sector Undertakings) and private corporates came forward with their plans. We evaluate the scale of implementation of these plans based on data provided by the human resource development (HRD) ministry and media reports (figures as seen on August 11, 2015). After Prime Minister Modi’s speech, an action plan was formulated by the HRD ministry and passed on to the Ministry of Drinking Water and Sanitation (MDWS) in a circular. It stated that around 150,000 toilets would have to be completed by corporate or PSUs other than those constructed under the state fund. These PSUs fall under the Department of Defence, Department of Financial Services, Ministry of Coal, Ministry of Chemical and Fertiliser, Ministry of Civil Aviation, Ministry of Heavy Industry, Ministry of Mines, Ministry of New and Renewable Energy, Ministry of Petroleum and Natural Gas, Ministry of Power, Ministry of Railway, Ministry of Shipping and Ministry of Steel. The website of Swachh Vidyalaya (programme for sanitation facilities in schools under Swachh Bharat Mission) states that till date, 140,000 projects have been approved or booked under PSUs. Ninety-five per cent of these have been completed and the rest are under progress. Private corporates, on the other hand, have constructed 3,213 toilets or 93 per cent out of a total of 3,466 approved or booked projects. Corporates and PSUs are supposed to construct 150,000 toilets according to the action plan. Both categories have 145,000 toilets booked under their names. Even if we were to consider that all approved projects have been carried out, there is still a shortfall of 5,000 toilets. As per the handbook of Swachh Vidyalaya, of a total of 418,000 schools, 161,000 schools are yet to get functional toilets (either girls or boys). Assuming that each school needs 10 toilets and urinals together, the number of toilets required would become one million. Corporates and PSUs are supposed to construct 150,000 toilets according to the action plan. 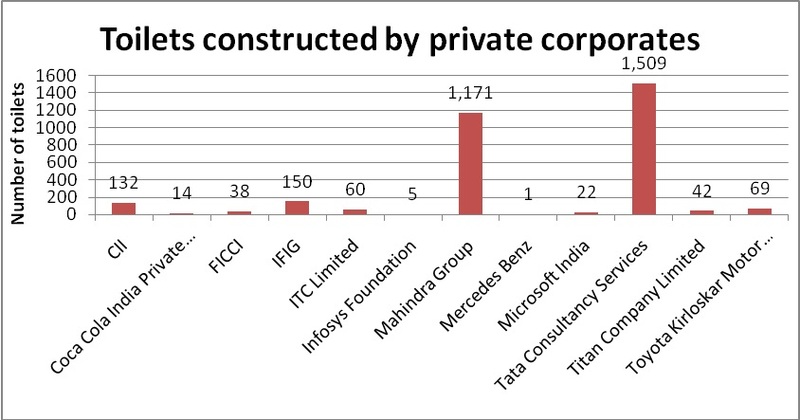 While Modi’s call to companies led to a spurt of corporate announcements committing to contribute to the programme, only 12 corporates came forward to book projects. Their plans cover only 35 per cent of all toilets to be constucted. Moreover, 60 per cent of them constructed less than 100 toilets booked under their names. 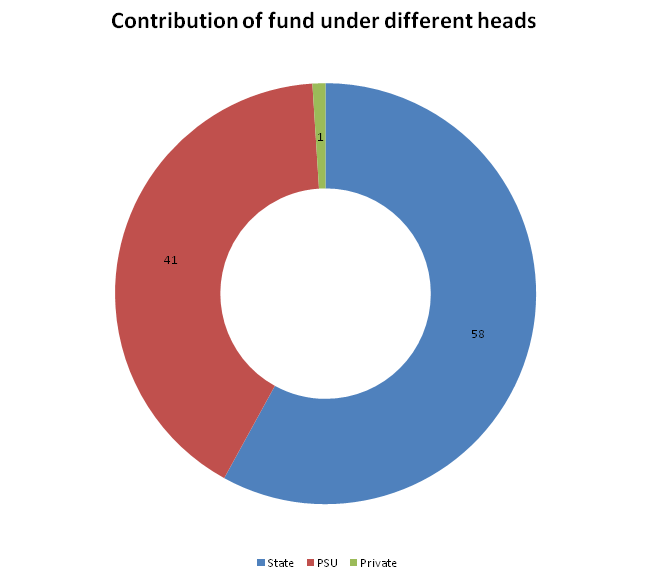 As for funds, private corporates have contributed only 1 per cent of the fund and PSUs have contributed 41 per cent, indicating a sharp difference between their commitments and actions. Even in June this year, the PSUs showed a lack of interest in constructing toilets and the state fund under Sarva Shiksha Abhiyan (SSA) and Rashtriya Madhyamik Shiksha Abhiyan (RMSA) had to be utilised to speed up construction. The government must get its act together and ensure that PSUs and private corporates are motivated enough. The travails of building a toilet – is this the road to a Swachh Bharat? Does government really want sustainable sanitation for rural areas? Issues related to Safe Water and Sanitation, simply do not have the same resonance during implementation and the situation becomes more worse prominently under Sanitation Sector. I am very sorry that even after a long association with the works under rural Sanitation Sector in Assam, which is one of the North Eastern States in India, I don’t feel comfortable with the PACE and Achievement of our works. I really consider it as our failure that we could not create the enabling environment to find a better and committed workforce to work relentlessly for the Rural Sanitation. Even, the necessary support is also missing from all fronts to endorse "WASH for All :: All for WASH". There are some stakeholders, who agree to accept the declaration "WASH for ALL". But when their turn comes to deliver, they just ignore "All for WASH". (a) Water Safety and Security including Water Quality Monitoring and necessary precautionary / remediation measures. (b) Prioritising water scarce / quality affected regions. (c) The basic thrust needs to focus on Awareness and Social Norms on the importance of a Sanitary Toilet at every household levels. (d) Robust Monitoring mechanism for use and maintenance of Sanitation facilities to address bottlenecks leading to slipping back from coverage pattern. (e) Total Environmental Sanitation including the proper Solid and Liquid Waste Management activities. (f) Facilitating Operation and Maintenance for WASH infrastructures in households as well as Institutions like, Schools, Anganwadi Centres, Community oriented facilities etc. eventually to ensure sustainability. (g) Institutionalised approach for capacity development to establish social equity / norms for the all round development of the communities with special thrust for the marginalised sections. (h) Massive approach on Hygienic practices for personal / food Hygiene. (i) Aiming at meaningful and participatory involvement of all stakeholders to ensure eventual effectiveness of WASH activities. An important aspect is the inter-sectoral convergence. For example, the Stakeholders working in the Nutrition Sector should not consider only about the Food and their respective calorific value, but also about the importance of WASH practices to get maximum out of such calorific food values. As an instance, Mid-day Meal Programme is sponsored by Government in Schools keeping in view of importance on Nutrition, but the conditions in the schools, arising out of absence of an well maintained WASH facilities or the Hand Washing practices, should also not be ignored, which may eventually hamper the desired impacts. (j) Necessary efforts / thrust oriented action plan during EMERGENCY SITUATION causing large scale displacement of human habitat. Adequate WASH activities must be prioritised for such displaced population. (k) Impacts of regions specific Climate Change. (l) Establishment of Regional Task Force for Implementation and Monitoring. (m) Lastly and not the least, the political WILL and SUPPORT for establishing the desired mandate. So there is a NEED of a specific Approach in this regard to ensure 100% ACCESS to Sanitary Toilet and also for sustained Drinking Water Security ( Availability, Accessibility and Adequacy ) for ALL. Considering the UN resolution declaring the Access to Water and Sanitation as Human Right, the WASH activities have already been included as Individual Goal under Sustainable Development Goals (SDGs), unlike that included as a part of Goal No-7 ( Environmental Sustainability ) in earlier MDGs. The Goal No- 6 under proposed SDG is to Ensure availability and sustainable management of water and sanitation for all. Hence it is most likely now that improved WASH activities shall be prioritised in all fronts including Household and Community level to create far reaching impacts on HUMAN health. The CALL to the Nations is to adopt region / state specific POLICY / Agenda for all of the abovesaid approaches to address the issue of Well-being of Mankind and the Environmental Sustainability. So let us pledge - "WASH for ALL :: All for WASH". I guess it is written by someone who doesn't know how numbers work. Let's take an example. we start construction of 10000 toilets on July 1 with a target of say 30 days. Nothing moves, the completion target at the end of 15th July was just 1000. The rate of toilet construction would be 1000/15=66.66. But work is in progress at other places. And they know that the deadline is before 30th July and the construction must end. Now let's say that another 2000 were reported to be complete by 25th July. Therefore, we see two data now. One is the rate of construction till now i.e. 3000/25=120 toilets per day and rate of construction between 15-25th July i.e. 2000/10=200 toilets per day. Now towards the end all toilets were built. So there are three data now -a) Total rate of construction - ie- 10000/30 = 333.33 b) rate of construction between 25th and 30th = 7000/5= 1400 per day and c) rate of construction between 15th and 30th = 9000/15= 300 toilets per day. Any infrastructure project that is being constructed will always be inflated towards the end. Period. Thank you so much for reading the article with interest and commenting. We are happy to know that you are also equally concerned about the state of toilet construction in the country. Its great to know that in any infrastructure project, although there may be a delay in initial period, at the end, the speed of construction really gears up. If that is the case then we should say that the officials have done a commendable job. Still one question remains - Are these toilets which are constructed at such great speed at the last phase are technologically sound, usable and with water connection? I think people have already started debating on it. If we say that every thing is working in these toilets built in the last phase of any project then there is no doubt that we are surely moving towards a better India. We once again thank you for letting us know how the construction rate is inflated in the last phase of any project.